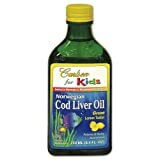 Carlson for Kids Cod Liver Oil Carlson for Kids Norwegian Cod Liver Oil has a great lemon taste and is naturally rich in DHA and EPA, omega-3& 39;s important for healthy brain development and vision in growing children. Carlson for Kids Cod Liver Oil contains 550-625 mg of omega-3& 39;s in each ½ teaspoonful. Carlson Cod Liver Oil comes from cold-water fish found in deep Norwegian waters, and is bottled in Norway to ensure maximum freshness. Cod Liver Oil is a natural source of important vitamins A & D. Natural-source vitamin E is added to ensure the freshness of the oil. THIS PRODUCT is regularly tested (using AOAC international protocols) for freshness, potency and purity by an independent, FDA-registered laboratory and has been determined to be fresh, fully potent and free of detrimental levels of mercury, cadmium, lead, PCB& 39;s and 28 other contaminants.